Associate Prof. Joy McConnell, one of the most dedicated and dynamic Nursing faculty members in the Brooks Rehabilitation College of Healthcare Sciences, retires at the end of this month. 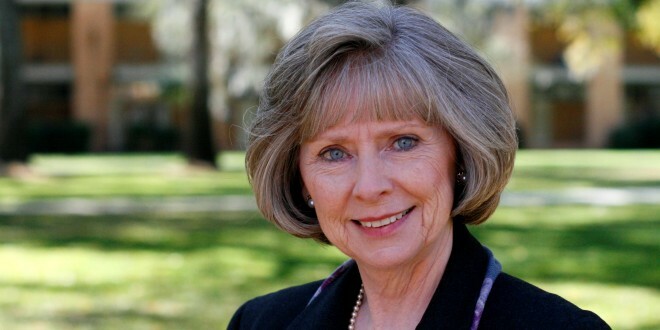 She has held various professional positions throughout her career, after receiving an Associate Degree in Nursing in 1971 from Florida Junior College, a Bachelor of Arts in Psychology in 1974 and a Bachelor of Science in Nursing in 1980 from the University of North Florida, and a Master of Science in Nursing in 1985 from the University of Florida, where she also received additional education for certification as an adult nurse practitioner in 1994. Her areas of research interest include innovative educational strategies, pathophysiology and management of obesity. Dr. Carla Fry stated, “For me, Joy embodies all that is right with the Nursing profession. She is caring, kind, a consummate professional, meticulously detail-oriented, and a strong advocate for our students and faculty. Associate Dean Dr. Cheryl Bergman explained, “When I joined the faculty in 2001, I was paired with Joy to teach undergraduate pathophysiology. This course was extremely rigorous and very detailed but Joy mentored me into the course slowly and deliberately. She provided me the latitude to make the lectures my own and was open to my opinions and suggestions, thus instilling confidence in a junior faculty. I will always be grateful for this mentorship for as it shaped me into the academician I am today.